Have you ever hesitated when analysing a candlestick wick and wondered what kind of importance it had? market sentiment quicker and more efficiently. I will, of course, explain exactly how the wick and the wick percentage are calculated but then also indicate the meaning behind the wick percentage of a candlestick. 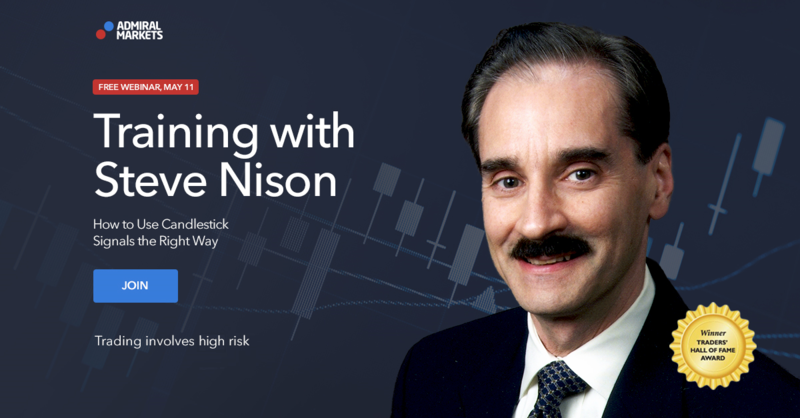 For an in-depth lesson and training on candlestick, make sure to join the webinar with Steve Nison, the father of modern candlestick charting and winner of the traders’ hall of fame award. The number of seats is limited, so be sure to click below and reserve your spot now. How to measure the wick of a candlestick? The candlestick has a wick on both the top and bottom of the candle. Traders can therefore calculate two wicks for each candle, although typically only one of the two is relevant for actual trading decisions (see next paragraph). Step 1. Find the candle high and note or remember the price level. Step 2. Find the candle close and open and use the level which is highest. Step 3. Subtract the candle high (step 1) from the open/close (step 2). Step 1. Find the candle low and note or remember the price level. Step 2. Find the candle close and open and use the level which is lowest. Step 3. Subtract the open/close (step 2) from the candle high (step 1). The top wick is 1.0700 — 1.0695 = 5 pips. The bottom wick is 1.0650 — 1.0647 = 3 pips. How do I measure the wick percentage? Now that the wick size is calculated, it is important to compare it to the total size of the candle. This will provide Forex and CFD traders with a wick percentage and that in turn gives me information about the market sentiment in each candle. The total size of the candle is the candle high minus the candle low. The wick percentage of the top wick is top wick size divided by total candle. The wick percentage of the bottom wick is bottom wick size divided by total candle. The top wick is 5 pips divided by 53 pips (1.0700-1.0647) for 9.4%. The bottom wick is 3 pips divided by 53 pips for 5.6%. What does the wick percentage indicate? The wick percentage offers critical information about the market sentiment during that candle. It provides traders with critical information about whether bulls/bears are in control of a candlestick or not. Wondering why and how? Let’s examine. The wick percentage simply shows the winner and loser of the battle between bulls and bears in each candle. Countless long and short positions and orders are driving price up and down but when the candle closes, the candle wick (or lack of it) explains who dominates the candlestick. this could provide traders information that a continuation is likely. or if there is a breakout occurring, then this could indicate a strong breakout. this could indicate weakness and a potential bearish bounce, reversal or rejection could take place. The opposite is equally valid for a candle close near the low, which indicates that bears remain in control. A bearish close which is far away from the low also indicates weakness and potential bullish bounce or reversal. What wick percentage is key for reversals and breakouts? Usually, only one side of the wick is important. Bottom wick more important: for instance, if price is reaching a key support level, then the bottom wick matters most because that shows whether a bearish breakout below support or a bullish bounce/reversal at support is occurring. Top wick more important: the opposite is true if price is reaching a resistance level. In that case the top wick is more important to understand whether a breakout or bounce is occurring. 22.5-33% wick → bears or bulls are probably in control but it would be good to closely examine other factors and the overall market structure. 33-67% wick → nor bears or bulls are in control: indecision. 67-100% wick → bears or bulls have lost control and reversal could occur. None of the percentages are guarantees — nothing ever is with trading. These are rough guidelines that I use when price is reaching a key decision zone or point of confluence. analyse the market structure, trend, patterns, and support and resistance so as to understand whether that candlestick will have any significance. Relatively larger sized candlesticks will have more importance than smaller candles. The same holds true for candles of higher time frames like the 4 hour or daily chart compared to 1 and 5 minute charts. MT4 Supreme Edition ranging from an indicator package to mini-terminal to extra mini charts. And for those that are interested in a live training with the master of candlesticks Steve Nison, make sure to reserve your spot by clicking on the button below.